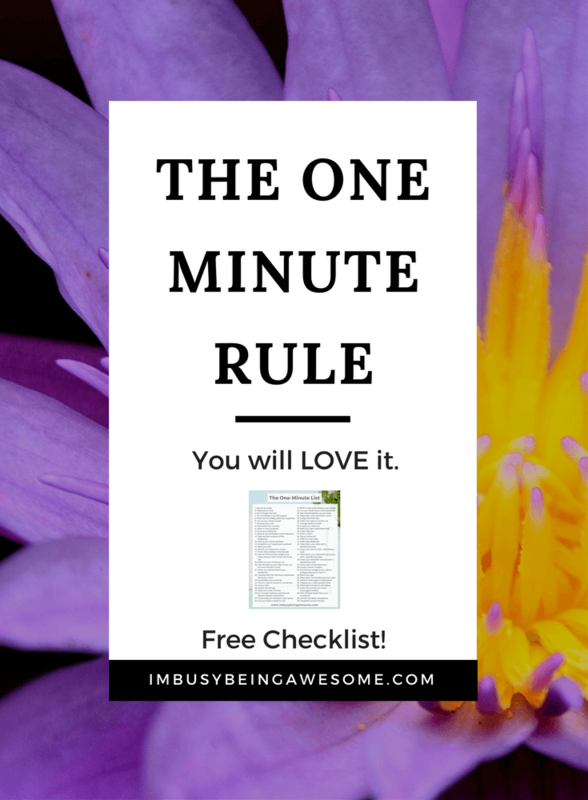 The One Minute Rule – You will LOVE it. I hope you’re stoked for today’s post, because I have a game changer in store for you. And while it promises big results, it also guarantees minimal effort. 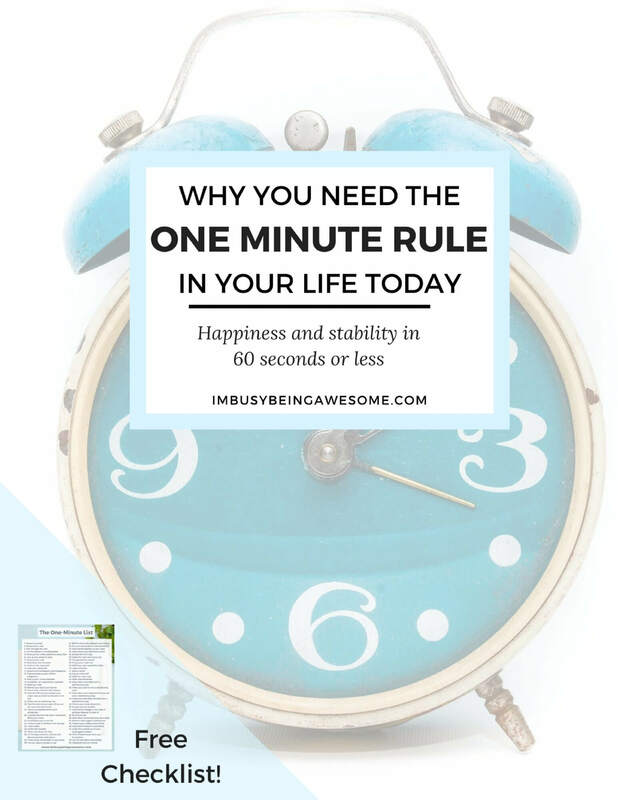 Today I’m sharing with you a little strategy called the One Minute Rule, which has made an incredible difference in my day-to-day life. Do you know the saying, “work smarter, not harder?” This technique falls squarely into that category. 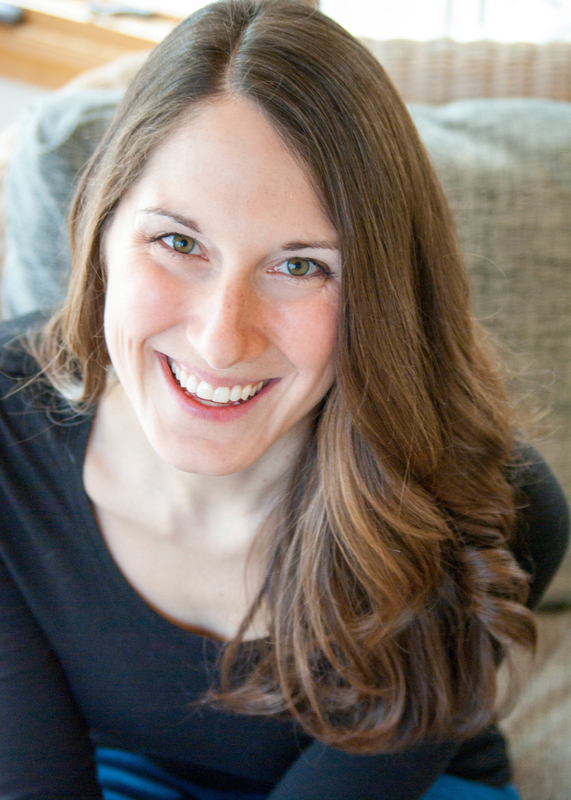 I learned this technique from Gretchen Rubin in her book, The Happiness Project. 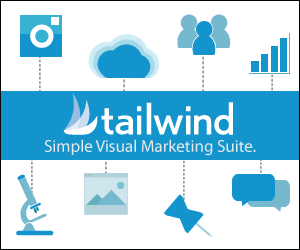 (I highly recommend checking it out; it’s fantastic.) Essentially, Rubin recounts her 12-month experiment of finding happiness by combining the “wisdom of the ages, current scientific research, and lessons from popular culture.” It’s fascinating. Before we dig into the one minute rule, however, let me provide a little background. Last Monday I offered you a list of organizational strategies – 26 to be exact – starting with the letter A and ending at the letter Z. Like Rubin, I’m a firm believer that by creating outer order in our lives, we simultaneously establish an inner calm. 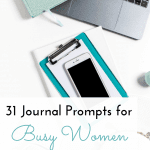 These 26 suggestions are a great way to help you get there. Luckily, I have a solution. This is where the one minute rule comes in. 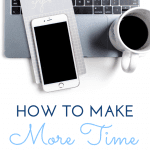 Simply put, the one minute rule suggests that whenever you come upon a task that you can complete in under one minute, do it without hesitation. Don’t pause to consider, and don’t tell yourself you’ll do it later. Instead, take those few seconds and accomplish the task then and there. Remember, I am not talking about the major items on your to-do list. In fact, these one-minute details don’t even make it on your to-do list. Rather, these tasks are the “little things” that, while seemingly insignificant, play a significant role in your everyday life. When I say “little things,” I mean the everyday habits that you barely register while doing them. Let’s change that simple habit. Instead of putting the unopened mail in its usual pile today, take one minute to recycle the junk (that’s what most of it is anyway!) and open the 1-2 letters that might be of importance. Similarly, rather than leaving your coat on the back of the chair and your shoes at the front door, put them away in the entryway closet. Instead of sticking your breakfast bowl in the sink, rinse it out and put it in the dishwasher. Is someone waiting on a quick email that literally requires a yes or no? Send it off now and get it out of your inbox. The problem is, when we put off these tiny tasks, that minute we promised rarely comes. Instead, these little tasks accumulate and create an invisible weight on our shoulders that pull us down. What’s more, because they are such minutiae, it’s difficult to even recognize the root cause of our tension at all. If you stop for a minute, however, and you really look around your home, you’ll see the culprit of that stress; it’s your 4 pairs of shoes laying by the front door, your coat on the back of the chair, your sink filled with dishes, and the stack of mail on your kitchen counter. 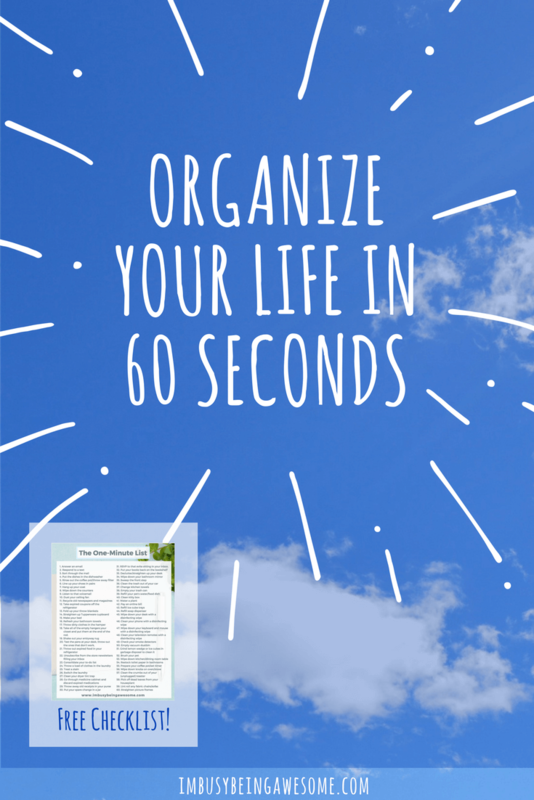 If you just take 60 seconds, however, and you put these things away right when you have the opportunity, the work is done; you don’t have to remember to “get to it later,” because you already did. Now, I realize this might sound like a pretty basic strategy. But that’s not a bad thing. In fact, I’ve been following this rule for a few weeks now, and I can’t tell you how much of a difference it has made in my life. And all in short 60-second intervals! To give you a simple analogy, the one-minute rule is like wiping down the kitchen counters every night after dinner. 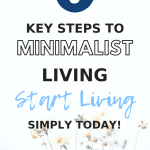 Rather than letting the mess build up throughout the week, you’re simultaneously keeping on top of things while also establishing both outer order and inner calm. What’s more, you’re doing this all in under 60 seconds. What more could you ask for? Have I peaked your interest? Are you looking for a few suggestions to get you started? No problem! 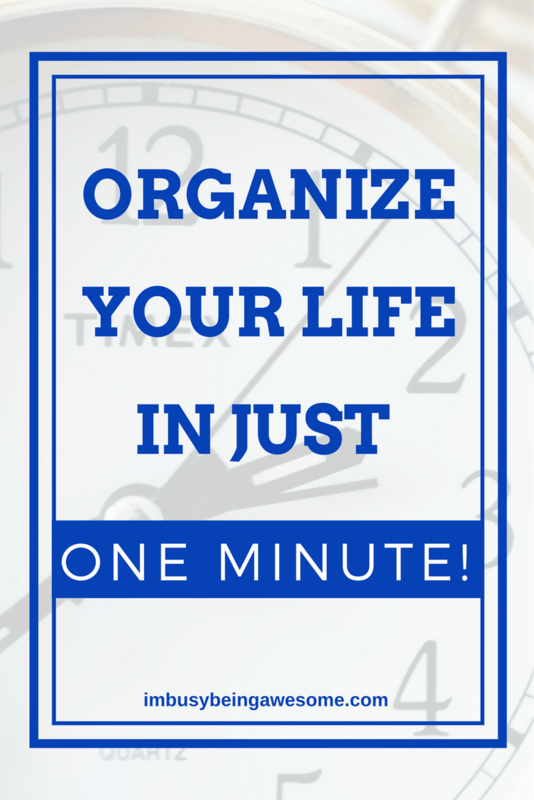 Here is a list of 10 things you can easily do in one minute or less. Fold up your throw blankets and straighten the pillows on your couch. Can I interest you in a few more suggestions? Great! How about 60 of them? 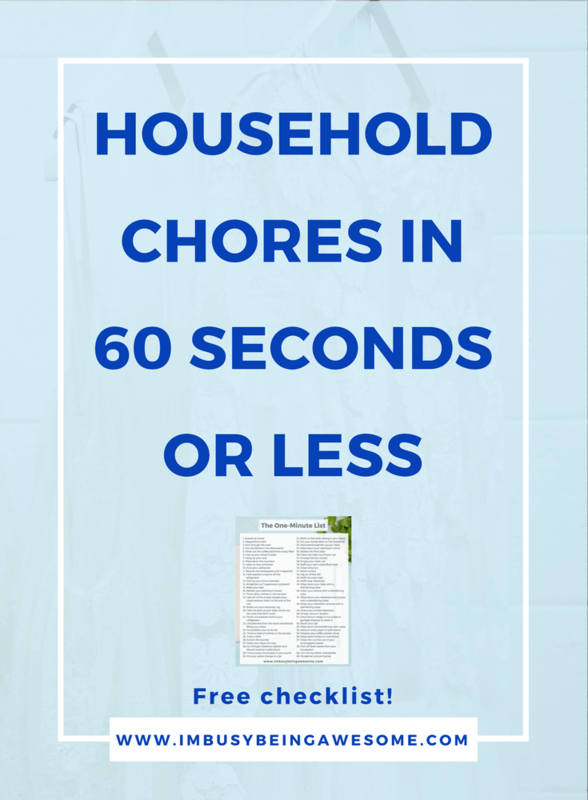 Click here for a free list and get rid of that little stuff TODAY! 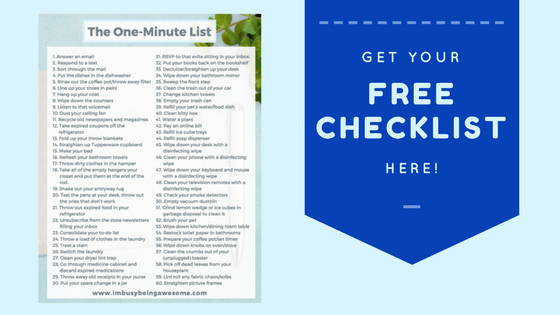 What would you add to the one minute list? Have you tried this approach before? Are you willing to give it a shot? Let me know below! So awesome, definitely going to make this new rule one I follow!! Thanks Paula! You ROCK! Great strategy!! I feel like I do this every day. I would like my husband to start doing it too…and my kids!! Would make a huge difference! I’m going to have to check out that book. It’s been on my reading list for a while now. such a great idea!! reminds me of the 5 second rule! You’re so right. These simple tasks can make one’s life easier. Thank you for the reminder. I love this rule! And the printable with examples is great. I have been hearing a lot about this book, I think that is a sign I need to read it. I LOVE what you shared about the belief that if we can calm outer chaos (obviously paraphrasing here), that we can achieve inner calmness. I am DEFINITELY this way. Stellar post and I love that this has a name!! 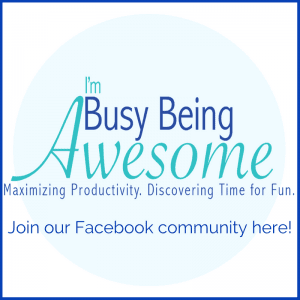 I actually try and do this a lot as I’m avoiding the biggger items on my to do list – hence why you’re A-Z list is a priority for me!! It is amazing what we can accomplish in only one minute. I do several of these but could improve and make life that much easier around the house. What an amazingly easy to do tip that will make such a difference! I’m going to try it this week.